Following his arrest, the professor spent 6 months in Israeli administrative detention, an illegal practice of indefinite incarceration without any legal process, no charges let alone trial, and under ‘secret evidence’ that is never revealed to the prisoner nor their lawyer, and may or may not exist. As of 1 March 2014, Israel was holding 183 Palestinians under administrative detention. On Thursday 24 April this year over 100 Palestinian political detainees went on an open-end hunger strike demanding the end of administrative detention. That was four weeks ago today (21 May); more prisoners have joined the strike along the way, bringing the total number to over 140; and even more are expected to follow. “No-one wants to be hungry,” says Raed Amer, Nablus chairperson of the Palestinian Prisoners Society, an organization that supports prisoners and their families. But what other methods do people held incommunicado in occupation dungeons have, to fight for their rights and their dignity? In an attempt to break the hunger strike, the Israeli Prison Service (IPS) has tried a diversity of tactics except for one: meeting the strikers’ demands. The repressive measures include both physical and psychological violence and abuse: isolation; severe beatings (in some cases prisoners lost consciousness for several hours, during which no medical assistance was allowed); denial of water and salt which are essential for human survival; denial of lawyer and family visits; violent raids and searches during which prisoners are made wait in an overcrowded cage while handcuffed; mass transfers from one prison to another, designed to disrupt and isolate; and dehumanizing treatment and conditions – e.g. confiscation of all personal belongings, denial of basic hygiene products and change of underwear, filthy toilet facilities, and cells of a size that violates IPS’s own regulations. None of these repressive methods are new in Israeli dungeons. For example, during the 2004 hunger strike, Eshel prison authorities confiscated water, salt, milk, and juice from striking prisoners. Humiliating strip searches and other punitive measures, as well as solitary confinement, were in place in the Nafha, Rimon, and Naqab prisons during the 2012 hunger strike. Even IPS medical staff are collaborating with these increasingly repressive actions against the hunger strikers. The Palestinian Prisoner Support and Human Rights Association, Addameer, reported recently that after Mahmoud Shabaneh fainted as a result of his hunger strike, prison staff waited for 3 hours until they finally transferred him to the prison clinic. Doctors there then tried to offer him food as a provocation, which is in direct violation of the World Medical Association’s Malta Declaration on Hunger Strikers, of which Israel is a signatory. The Malta Declaration specifically states that “physicians must try to prevent coercion or maltreatment of detainees and must protest if it occurs“. Additionally, the Israeli Knesset (parliament) is currently debating a bill that would legalize force-feeding, a practice the World Medical Association considers “never ethically acceptable“. Force-feeding in Israeli dungeons already has a tragic precedent: in the early 1980s, after a lengthy hunger strike in Nafha prison, Ali Ja’fari and Rasem Halawi died after doctors inserted the tubes in the wrong place. 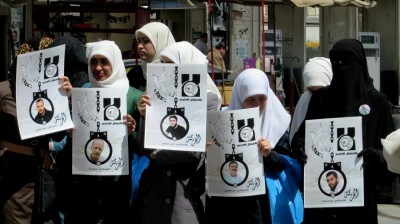 Nablus protest in solidarity with the hunger strikers. 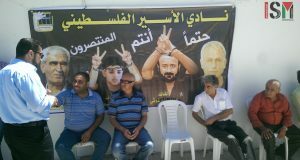 Currently 24 of the hunger strikers are from Nablus (photo by IWPS). The current hunger strike is yet another attempt of Palestinian political prisoners to bring Themis to the place she has been absent for so long. 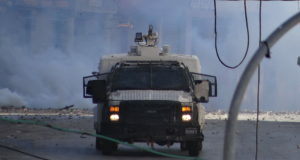 In 2012, after a mass hunger strike that started on 17 April, Palestinian Prisoners Day, and involved around 2,000 prisoners, an agreement was signed between IPS and the Higher Committee for Prisoners in which Israel promised to limit its use of the illegal practice of administrative detention to exceptional circumstances. Two years later, administrative detention is still systematic. Fake promises? Hunger strikes have played an important role in the struggle of Palestinians held prisoner by Israel. “Every achievement in prisons for simple, daily things such as sanitation, bed, or radio have been reached through hunger strikes,” says Saed Abu-Hijleh, an activist, poet, and lecturer at An-Najah National University in Nablus. During the Oslo Accords of the 1990s, Abu-Hijleh says, Palestinian people were expecting all political prisoners to be released from Israeli jails, since a ‘peace treaty’ was being signed between Israel and the PLO (Palestine Liberation Organization). However, such hopes never materialized and Palestinian prisoners became a bargaining chip in political negotiations – the so-called “peace process” – ever since. Moreover, Jawad Boulus, chief lawyer of the Palestinian Prisoners Society, said in an interview with IWPS that the Israeli state is becoming more and more repressive: it places Palestinians in administrative detention simply because they resist the Israeli occupation. Some people have been held in prison without charges for 10-12 years; the list of administrative detainees includes highly educated people – doctors, lawyers, journalists, as well as political and community leaders. Boulus added that two administrative detainees started their hunger strike earlier and have now spent more than 80 days without food; the Israeli military court system rejected their appeal and ordered them to serve additional time. According to Boulus, one of the most important achievements of Palestinian prisoners is that they’ve developed a prisoners movement with a code of conduct and a moral value system. “Officers and guards can see how detainees are engaged in a human struggle against injustice,” he says. Whether they choose to accept what they see or continue being complicit in the suppression of this struggle for human rights and dignity is another issue. 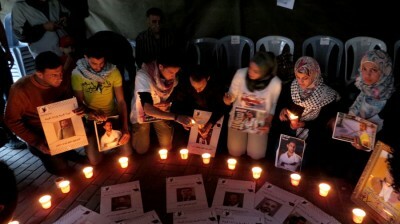 The current Palestinian hunger strike is to hit Day 30 on Friday 23 May. After 14 days on hunger strike, catabolysis – a biological process during which the body starts to break down muscle tissue and fat for survival – occurs. Physical implications are increasingly serious: people start having difficulty standing up and suffer from severe dizziness, weakness, loss of coordination, and shivers. After 3-4 weeks on hunger strike, or when more than 18% of body weight is lost, there is a risk of medical complications becoming permanent; among them – loss of hearing and vision, indifference to surroundings, and incoherence. This is when the body, having no other source of energy, starts consuming itself: first fat, then muscles, and finally vital organs. It is generally considered that a healthy person who consumes water during their hunger strike would have an absolute limit of 60 days. However, many of the Palestinian ‘administrative detainees’ who entered the hunger strike were already in ill-health, due to Israel’s refusal to provide them with proper treatment while in prison. What thoughts run in the mind of a person on hunger strike? “You don’t think about your body – rather, you think about your family, your loved ones, and what you can do for them,” says Amer from the Nablus branch of the Palestinian Prisoners Society, who himself went on a 20-day-long hunger strike during his time in Israeli occupation prison in the pre-Oslo period. As if to echo his words, Boulous quotes from a poem: “I am ready to give half my life to somebody who can make a crying child laugh…” and adds that “every Palestinian prisoner case is a big issue”. Ending the occupation is a big issue. Helping families to visit their loved ones in prison is a big issue. National morality and resistance is a big issue. How to pass Qalandiya checkpoint without loss of dignity is a big issue. Israel’s crimes against human rights are a big issue. The fact that Israel tortures prisoners is a big issue. “We don’t have an alternative. We cannot raise the white flag,” Amer adds. “I am an administrative detainee…” – activists reading out stories of Palestinians held prisoners by Israel (photo by IWPS). – Waad Association for Detainees and Ex-Detainees warned of the serious deterioration of Palestinian administrative detainees’ health conditions after more than 3 weeks on hunger strike. Many of the striking prisoners are sick detainees denied medical treatment. – Liberated detainee Kifah Tafish, who spent 8 years in Israeli jails, has warned of escalating Israeli repressive policies against Palestinian striking detainees and encouraged people of conscience all across the globe to hold solidarity with the hunger strikers’ events in order to put pressure on Israel to stop prisoners’ suffering. Tell the Israeli authorities and IPS in particular what you think of their crimes against Palestinian political prisoners. IPS general contact email is ips@mail.gov.il, telephone number +972 (0)89776666. Can also be contacted through the website. Sign the petition demanding that Israel immediately ends the illegal practice of administrative detention (EN, FR, AR). Sign the petition calling on the International Bar Association’s Human Rights Institute to Protect Lawyers Fighting for Prisoner Rights in Palestine. Inform yourself and people around you: join Addameer’s STOP ADMINISTRATIVE DETENTION campaign.